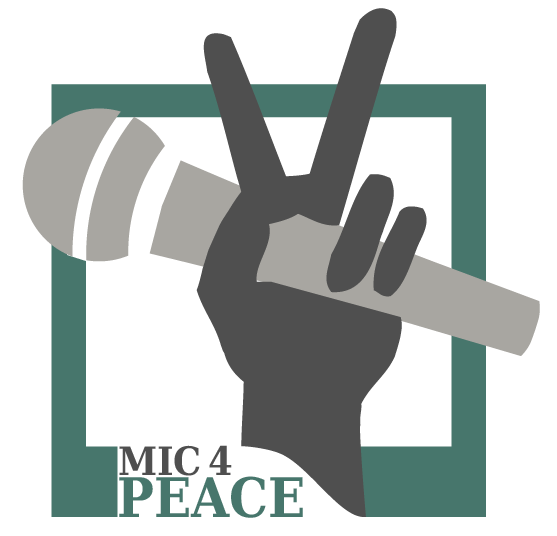 All Mic4Peace slammers are really bouncy and happy! After a fabulous evening at Thalia Cinema Dresden Wednesday 15 November we believe that we are hitting a nerve with our International Peace Slams in Dresden. The MOVE IT! Film Festival for Human Rights and Developement invited us on their closing even stage and we rocked it. This time eight slammers were involved to present their perspectives of being an international citizen here in Dresden, their concepts of peace and ideas about how to make the world a better place. Last Wednesday was the first time, dass we presented slams both in German and English to really reach everyone in the audience. And it worked out: the cinema hall was sold out two hours before the show, we had to send people home as there were no tickets left. Though the MOVE IT! Festival was extremely successful this year with full house almost every evening we also referred it to a name recognition that we achieved in the meantime – what a great success! We were even recorded from Dresden Fernsehen that evening, they plan to show the full program around Christmas, we will let you know! Congsi from China was the host of the evening and moderated in both languages, witty and charming as usual. This time Negar coming from Iran started and talked about peace beginning with a google research and ending with an own definition. Himani from India took over and showed clearly the big differences she found in the world and the trouble of adapting. Sia from Iran as slammer on the scratch and with most performances had a brand new presentation the personal decision everyone hast to do about how he wants to see the world. Farahnaz also from Iran had her second performance on stage. As a particle physicist and teacher she took us on a journey to the smallest particles on earth in order to prove possible coexistence, with both particles and human beings. Mohammed from Egypt had the most serious topic of that evening: historical guilt. Something that is worldwide known and inherited by so many nations – the audience was silent and very attentive. Finally, Sehrish from Pakistan and Neelakshi from India went on stage together, as friends. A friendship that would not be possible in their countries. So many people came to us after the program to congratulate and to encourage us to go on with this idea – of course, we will! This week we were selected for a one year support program by lassesunstun, a group of young creatives who really want to make a change in our city supporting sustainability and social impact startups, as we are somehow. 2018 will become very interesting – stay tuned. Next shows will be in Theaterhaus Rudi – three performances in three months, bring your friends, your colleagues and people who want to broaden their perception. Thank you, MD from Salt&Pepper Photography for these photos!